May 12th was a free cone day at Häagen-Dazs shops and to celebrate Adele Bruno at Tickled To Tangle themed this week's It's a String Thing (#92) with sweet sounding tangles: Butter, Cayke, Chocobox, and Kandy Ribnz. All of these tangle were new to me. I tried this challenge twice. 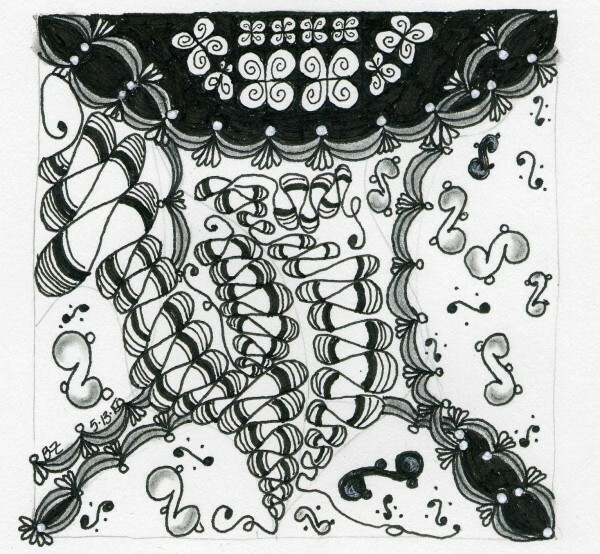 I was unhappy with my first tangle, as it felt crowded, chaotic and flat. I was too same in scale size. I like my second version much better. Chocobox reminds me a double cartoon dinosaur head. It was fun to do - there are couple black sheep chocoboxes who wanted to start life as figure 8s. I stumbled upon a very minimal version of it while learning it that I really like. I also had no idea that my Cayke tangle took on a life of it's own until I started looking up how to shade it when I completed the second tile. 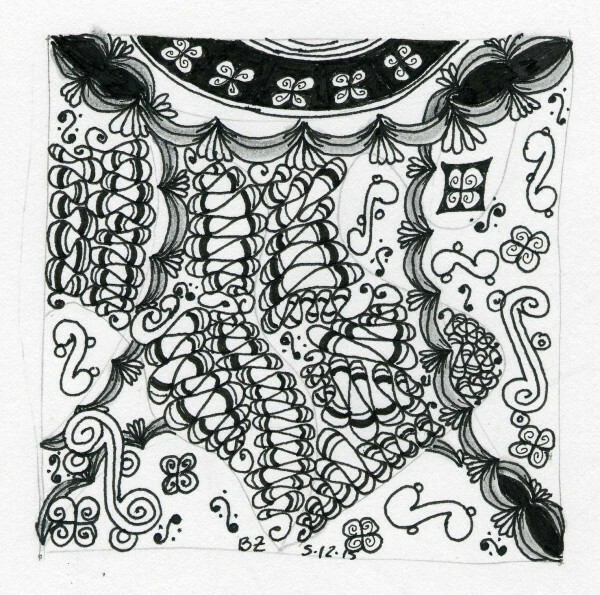 There i something very airy and floating about this Zentangle. And I felt happy at the end, so I guess it was good medicine. my first thought when I saw the tangles was mmm candy. The ribbons look like candy corn to me. The difference is startling actually, like you got all the chaos out in the first one and could float into the second.